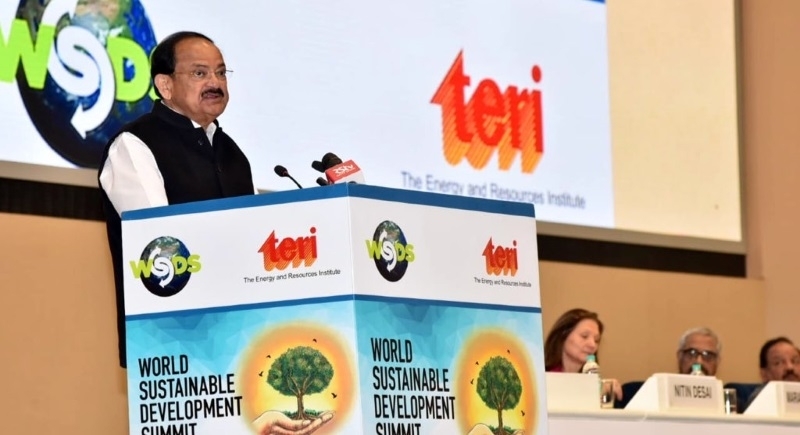 New Delhi, Feb 11: “Sustainable development is inclusive development; Sustainable development is a common goal for all world nations, given the unprecedented scale of environmental degradation and its drastic consequences that we have been witnessing,” said Vice President M. Venkaiah Naidu while addressing the inaugural session of World Sustainable Development Summit 2019 at New Delhi today. World Sustainable Development Summit 2019 started today in New Delhi. Vice President Naidu inaugurated the summit. The theme of the summit is “Attaining the 2030 agenda: Delivering own promise”. The summit will continue till 13 February with interactive sessions and dialogues. On the occasion of the inauguration, Naidu said, “ Sustainable development is inclusive which includes sustainable agriculture, sustainable mobility solutions, sustainable urbanization, sustainable energy security and clean energy, waste management and efforts in wildlife conversation and green innovations”. He stated that There is a need to make use of the endless possibilities of biotechnology and nanotechnology to develop a range of green products including nano-fertilizers. We should move towards more efficient systems of irrigation with ‘more crop per drop’ as our mantra. Greater thrust has to be placed on organic farming and on the use of natural means of pest control. He said, “Sustainable development includes sustainable agriculture. India is focussing on this aspect very sharply”. Addressing current challenges, Naidu said, “Climate change & global warming threaten lives & livelihoods of billions & upset delicate balance of nature. It is in recognition India is trying its best to include paradigm of sustainability & environmental conservation in all its development endeavors.” He also added, “Let us not forget that the more immediate impacts of climate change are felt by developing countries, because of higher dependence on climatic variables, especially when it comes to agriculture, and their limited capacities to adapt”. Further, he added, With the realization that the impacts of climate change are borderless and that our fates are deeply inter-linked, we must explore an equally unprecedented degree of collaboration and cooperation. “The Vedic philosophy of India has always emphasized the undeniable connection that human beings share with nature. Our traditional practices reflect a sustainable lifestyle. Vedic philosophy considers the earth as the mother and all life forms as her children” said Naidu. While addressing India’s role, he said, “India, along with France, initiated the 'International Solar Alliance' which already has one hundred and twenty-one members. The alliance is perhaps the most decisive step taken by any world nation towards developing clean energy”. On this occasion, India’s Minister of Environment, Forest and Climate Change, Dr. Harsh Vardhan, stresses how India has come a long way as a global sustainability leader, including through elimination of single-use plastic & establishment of the International Solar Alliance. The World Sustainable Development Summit is a flagship annual event of The Energy and Resources Institute (TERI). From the last 17 years, the summit worked with a focal point for global leaders and practitioners to congregate at a single platform to discuss and deliberate over climatic issues of the universal problem.